A/N My interviewee this week is recognised as one of the Top 25 European Office 365 Influencers. Only two women made this list. She is also one of the 4 women recognised in the Global Top 25 Office 365 Influencers. As if that’s not enough, she’s also been awarded the Microsoft Most Valuable Professional (MVP) in 2008, 2009, 2010, 2011, 2012, 2013, 2014, 2015. I was born as the first child of a very poor family, living in Eastern Hungary. I inherited my father’s skills at problem solving; he had been always good at school, but he didn’t have the chance for any higher education. In school, being the smartest and poorest child in the class was a very bad combination. Since I didn’t have too many friends, I turned to what I was good at: learning. My math teacher recognized my math skills and managed to let me into the programming classes. I loved sitting next to the Commodore +4s! Controlling what they should do was one of the most powerful experiences I’d ever had at that time. There was never any doubt that I wanted to study programming after high school. When I was accepted at the Budapest University of Technology and Economics, I thought my life was on track – but a few months into my studies, I realized that university was too much of a burden. The costs of my studies and living in the capital were way too much for my family to afford. I was at a huge decision point. Everything suggested I had to stop my studies and look for work. Nobody believed there was any way to avoid this and stay at the university, continuing my studies. But I didn’t give up. I was sure there must be some way. I made the decision: I would look for a job AND continue my studies. Due to the programming awards I had received during my high school years, I found a programming job at one of Hungary’s biggest and most well known IT companies. Five months after starting university, I found myself working there. I was saved! Those years were the hardest period of my life, though. I studied hard. I worked hard. I slept for only a few hours every day. My parents got divorced. But I was free. For the first time in my life, I was doing what I loved, and I could do this because I made it possible for myself. In the end, I finished studying and got my degree after seven years. And I already had 6.5 years work experience which proved to be a HUGE benefit. First of all, you have to be passionate about your job and you have to be persistent. Also, you have to love learning new things every day. Last but not least, you have to be a team player. Even if you work from home like I do, IT projects are always complex, there’s always a whole team of professionals involved. What I do is quite complex. I help enterprise organizations with their Information Architecture (how to organize and classify their content, how to “clean up” and optimize their processes, etc.) as well as with Enterprise Search (how to make the content findable and discoverable, how to help users reduce the time spent with searching – especially with non-productive searching). It sounds like it’s an IT role, but it’s much more about understanding people’s content, intent and behaviour. It’s much more about psychology. Maybe this is why I not only like working on people’s Information Architecture and Search solutions, but also mentoring them with their own life and career path. It’s amazing how similar these two things (consulting and mentoring) can be! First, in IT, we have to solve complex problems and we have to deal with new kinds of problems every day. If you don’t like that, you’re lost. It doesn’t matter if you’re a programmer, an administrator, a project manager or a system architect – if you don’t like solving complex problems, you cannot be good at it. Secondly, in what I do, it’s very challenging to be able to think like my customers. Even organizing our own stuff can be challenging, just think about your kitchen or children’s rooms. But being able to understand the content and knowledge of someone else quickly and to provide a structure that helps them – this is something that’s never easy. But this is why I love doing this! Thirdly, you should never forget: IT is always about serving humans. Always. Even if you never see the end users and customers, working with those bits is always about making people’s life easier in some way. But beyond that, I like the human part of my job the most. I like travelling the world and seeing beautiful places. I like meeting people, making new connections, having friends literally around the globe. I like helping others with their journeys. I especially love helping young women with their career paths: to find their real passion, their real mission. To motivate and inspire them – this is what I like the most. A few years ago, before my children were born, I was working for a company in a role I didn’t really like, for quite a low salary. I wanted to quit, but at that time I was too young and not brave (self-confident?) enough to discuss it with my managers. I applied for a job, which I really wanted, at a consultant company. To my great delight, they invited me for an interview. I thought the interview went well, and felt good that evening. The very next morning, one of my managers invited me to his office. Each of my managers were there, and when they closed the door behind me, I realized it must be something serious. It turned out, that one of the guys who invited me to that interview the day before, was a good friend of one of my managers. And of course, he’d called him asking about me. It was a really embarrassing situation and an annoying discussion that I had with my managers that morning. I felt lost. I even felt stupid. But in the end I got a promotion at my existing company and my salary was almost doubled! It was a happy ending, but I wouldn’t encourage anyone to be as stupid as I was then. Be self-confident. Be brave. Trust yourself. Maybe you won’t get the promotion I got that time, but even if you leave, it’s much better to do so in a friendly manner. I needed a few more years to learn that, but was lucky to learn that lesson through experience. My most nerve-wracking moment was many years ago when I had to make a presentation to a hall full of around 100 people I didn’t know. I’ve always been comfortable presenting to small familiar groups where you get some interaction. But to stand on a stage and not even be able to see the audience out there, let alone gauge their reaction is quite something. It’s something I volunteered to do because I knew it would be hard – something about facing your fears and all that! Never give up. Even if you feel it’s impossible – it’s not! There’s always a way to move forward! Be curious. Be passionate. As Walt Disney said, “If you can dream it, you can do it.” – See more here. It takes time to build skills and move up the career ladder – don’t be impatient. Don’t pull yourself down, but don’t be over-confident either. I thought I knew it all at 25 and I look back now and see that all those people who told me how important experience is were absolutely right. Most importantly – be yourself. Find a role that fits who you are. Don’t try and be someone else. Be proud of who you are. A/N My interviewee this week is someone who used to be in the study next to me at Rishworth School. I know you’ll enjoy this interview with an amazing woman who’s forged her own path and has some great tips to share! When I left school, I just wanted to be financially independent. My real dream was to do Interior Design, but I figured there wasn’t a serious living to be made from that (tell that to Kelly Hoppen!) and I didn’t want to study any longer anyway. Not really knowing what I wanted to do, I visited a job agency and landed a job as a trainee sales ledger clerk at Wimpy International the same day. Rapid progression in accounting related jobs led me to study for accountancy exams, and I worked in that field for many years. In those days it was the accountants who were exploring computerised options and I was probably one of the first people to use a spreadsheet on a PC. As I played around with spreadsheets and then became involved in projects to automate processes, I found myself enjoying that side of things so much more. As I was working for a big company it was easy to make the transition into IT and I became a Business Analyst, defining system requirements, designing solutions & processes and sometimes managing projects. I had found my niche, and although I have moved between business and IT roles over the years, and even taken a break to study Interior Design and work in that field (still requirements analysis, design and project management! ), I know that what I really am is a Business Analyst. Today I feel that I have my dream job as a consultant working for a multinational software solutions company visiting clients across Europe & South Africa to run requirement gathering workshops. To be a good business analyst you must of course have an analytical mind. You have to be able to quickly understand processes, document them and critique them … always looking for better ways of doing things. An empathy with people at all levels is important as you have to gain their trust and listen to what they have to tell you. It’s not a technical role – more of an interface between business people and technical people. Can be very social at times, and very isolated when you have to shut yourself away and document findings and recommendations. You need initiative and the ability to get on with it! My current role involves me mainly with Financial institutions where I work with systems to make business decisions, but a key facet of a good business analyst is the ability to walk into any part of any business and quickly grasp the fundamentals of the relevant processes in place there. Essentially, it’s about business, but that covers a multitude of things, and in this age of technology the solutions called for may be very different to those used previously. I think the most challenging aspect is trying to win over people who are set in their ways to new and better processes. Businesses are always looking for efficiency and improvement, but you often find someone whose authority comes from their specialist knowledge of what they do and they can be very defensive when you try to find out the detail or suggest alternative approaches. I particularly like the project related aspect. Each project has a start and an end and even thought you might be working on several at once that overlap, there is always a sense of making a difference and moving on to the next challenge. My worst nightmare is routine – as an accountant, I could tell exactly what I’d be doing on day x of each month. I hated that. My most nerve-wracking moment was many years ago when I had to make a presentation to hall full of around 100 people who I didn’t know. I’ve always been comfortable presenting to small familiar groups where you get some interaction. But to stand on a stage and not even be able to see the audience out there, let alone gauge their reaction is quite something. It’s something I volunteered to do because I knew it would be hard – something about facing your fears and all that! To me, the most important thing is to do something you really enjoy. Follow your heart. Careers advisors try to push people into what they seem like they’d be good at, but if their heart’s not in it, they aren’t going to do well. Something that doesn’t come easy, but if you have a passion it is far more likely to be a success in the long run. It takes time to build skills and move up the career ladder – don’t be impatient. Don’t do yourself down, but don’t be over-confident either. I thought I knew it all at 25 and I look back now and see that all those people that told me how important experience is were absolutely right. And most importantly – be yourself. Find a role that fits who you are. Don’t try and be someone else. Be proud of who you are. 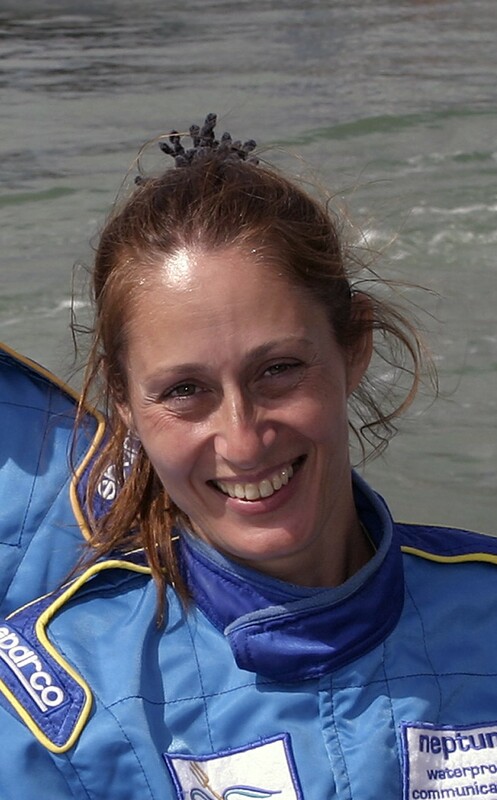 Rose Lores – also an avid powerboat racer!